Osmosis: Vestibulo-ocular reflex and nystagmus. (2019, April 24). 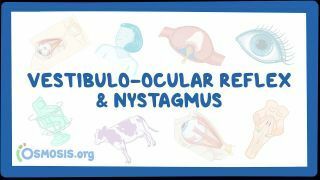 Retrieved from (https://www.osmosis.org/learn/Vestibulo-ocular_reflex_and_nystagmus). Nystagmus is a condition of involuntary eye movement, acquired in infancy or later in life, that may result in reduced or limited vision. Due to the involuntary movement of the eye, it is often called "dancing eyes." is described as rapid, repetitive, involuntary eye movement.